Looking for Alibrandi by Melina Marchetta – Oh, this book was just <3333 All the love. I can’t believe I waited so long to read anything by Melina Marchetta. One Plus One by Jojo Moyes – You guysssssss!! This book had me smiling and shedding tears then laughing, then laughing with tears in my eyes. It was perfect. Cress by Marissa Meyer – THIS SERIES! It gets better with every book. Cress herself I loved! I thought she was so believable. It was also soooo cool to see the characters all together! Eeee like the Lunar Avengers or something :D Pretty much everything about this book was wonderful: the pacing, the action, the close-calls, the romance, the revelations. Secrets upon layers of secrets. And the glimpse of Winter! The Art of Lainey by Paula Stokes – I loved the premise, which was clever. I loved Lainey’s character arc, which was completely believable. I loved her spacey family. I loved her chemistry and banter with Micah. I LOVED MICAH. Oh my god. I tend to judge contemporary romances on whether it’d be a good romantic comedy movie, and how many swoopy, butterfly feelings I get in my stomach. How much I smile and swoooon. And um yeah, this book had a lot. Between The Devil and the Deep Blue Sea by April Genevieve Tucholke – A terrifying, sensual, disturbing, and pretty damn great book. I loved her crisp but dreamy writing; it was visceral and perfectly detailed. I could smell the salty sea air and taste the iced tea. And damn if River wasn’t one of the most confusing, wonderful, terrible characters I’ve ever read about. This book was super creepy and I loved it! The Diviners by Libba Bray – I’ll admit the size of this book scared me for a long time, but I’m glad I finally gave in and read it. It was so amazing that once I started reading the pages just flew by. Just the right amount of creepiness and intrigue. Cress by Marissa Meyer – I just love this series. Every new character brings something special to the mix. Even though these stories are fairy tale retellings every book feels completely fresh and unique, and they have a little bit of everything, from sci fi to romance. Attachments by Rainbow Rowell – This is by far my favorite Rainbow Rowell book. I thought nothing could top Fangirl, but Attachments was just perfect in every way. I loved all the emails and how we really got to know the characters through them. This is basically the book version of a romantic comedy but ten times better. Ignite Me by Tahereh Mafi – I could NOT wait to get my hands on this book this year! I was so excited to read the finale to this great trilogy and it did not disappoint. I know, I know, the ending did not live up to everyone’s expectations but I was totally on board with it. I also can’t believe this series is over *sad face* :( This whole series was fantastic and I am so in love with the writing. This series is hands down one of my favorites… EVER! A Dance with Dragons by George R.R. Martin – I put off reading this fifth installment in this series because I knew that there were no more published novels after this one. I couldn’t wait any longer, and after the season 4 finale I jumped right into this book and was hoping to get a lot of my questions answered. I didn’t get all the answers, but it was an exciting read and has me jumping out of my skin to read the next. I might be waiting a while though. :/ I am also happy I can browse the ASOIF forums without the fear of reading spoilers. YAY! If I Stay by Gayle Forman – I knew going into this book that it was going to be emotional, but ohemgee it was like my eyes turned into faucets and I couldn’t stop the water flow!! I cried so much reading this book and I loved this series! This first one was my favorite of the series and I pretty much read it in one sitting. I still need to read Rainbow Rowell’s adult books… And ah, CRESS! I read that in 2013, otherwise it probably would have made my list because it was EXCELLENT. I desperately need to read THE WINNER’S CURSE. I have ME BEFORE YOU, which I’ve heard is good (and very sad, which is great). 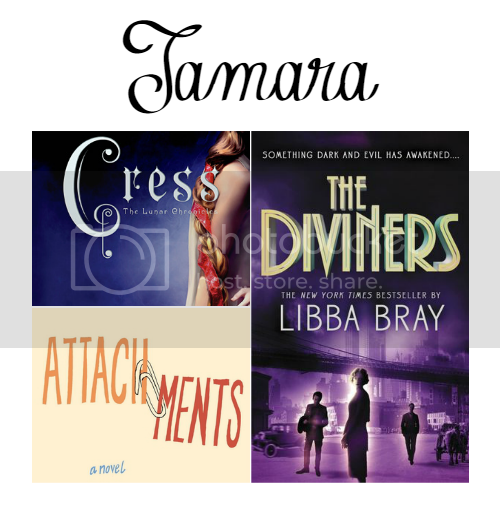 I want to read Attachments and all the other Rowell books in 2015. :D And yes, you DEF need to read Winner’s Curse AND Me Before You! Eeep I loved Cress! It’s the best in the series so far, in my opinion. I just love Cress (the character). I thought she showed the most character growth out of all the others and I felt more connected to her than Cinder or Scarlet. I am FREAKING OUT in anticipation of Fairest!! I love seeing Between the Devil and the Deep Blue Sea on here! I felt like that book went wayy under the radar when it came out. I love the unreliability of the narrator and the fact that you just KNOW something is not right with River. I really need to do a reread before I fiiiiinally get to Between the Spark and the Burn. I really liked CRESS, too. 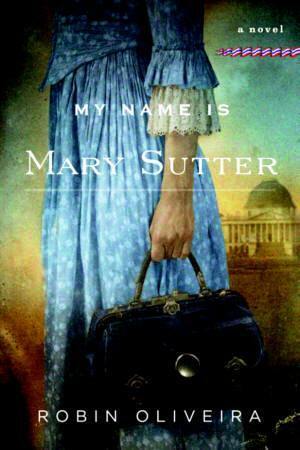 I’m pretty crazy about the whole series by Meyers. Same!! I love how all the books fit together and how the story is evolving. Cress was pretty awesome! And oooh Ignite Me! Loved that one too! I’m so glad that you enjoyed The One Plus One. I love Jojo Moyes, she’s a fantastic writer. I also really enjoyed Cress. The series is truly getting better with every book! :-) It looks like you’ve discovered and read some amazing books this year! Man, I really want to read Cress! I’ve already read Cinder and it was such a fantastic book! Check out my top 10 list! I agree with most of these, yay Diviners! It’ll probably make my list as well! Also, I need to read Between the Devil and the Red Sea. I hear it’s a bit crazy, but it sounds like the crazy I enjoy. Great picks! I just finished Winner’s Curse (and got my hands on Winner’s Crime) last week and I lovedddddd it!! Awesome choice! And by FAR my FAVORITE Rainbow book is Attachments!! Lincoln…sigh…i love him! Totally underrated in my opinion! Why have I not read this Melina Marchetta book, Jess?? I adore this author!!! Thinking this needs to be a must read in 2015. I loved Attachments! It would definitely have been on my list if I hadn’t read it like three years ago! Great list. Here’s mine. Ooooh, I’m thrilled that Attachments was a favorite Rowell for Tamara, because I’ve mostly heard her adult stuff wasn’t as good, which, for me, was true with Landline. I’ve been holding Attachments in reserve and dearly hope to love it. LAINEY BANTERRRRR. I hope whatever the third Paula Stokes book is will have this sort of banter again. Liars was fun, but verrrrry different. Cress was one of my favorites, too! :) BTDATDBS not so much, and I keep meaning to read The Winner’s Curse, but I haven’t gotten around to it yet. Oh well, as they say, there’s always next year. Great lists! Loved Cress! I def know Devil wasn’t for everyone and I get it, believe me. The Winner’s Curse is so good!! Yeah so many amazing books I want to read got pushed to next year :) Yay reading! I also really liked One Plus One, though it just wasn’t Me Before You, which is why it didn’t make my Top Ten this year. And yes, Attachments is definitely the best Rainbow Rowell. So cute! I loved Me Before You too, but I tried not to compare the two since One Plus One is totally different. Glad you liked it though!! And I can’t wait to read Attachments! The Diviners was HUGE! But it really did fly by and I loved all the different characters in it! Cress, obviously huge favorite. :) Also really enjoyed The Winner’s Curse; definitely turned out to be a book I enjoyed quite a lot this year! Great lists! I really want to read The Diviners! It sounds great. And I’m glad you enjoyed Winner’s Curse!! 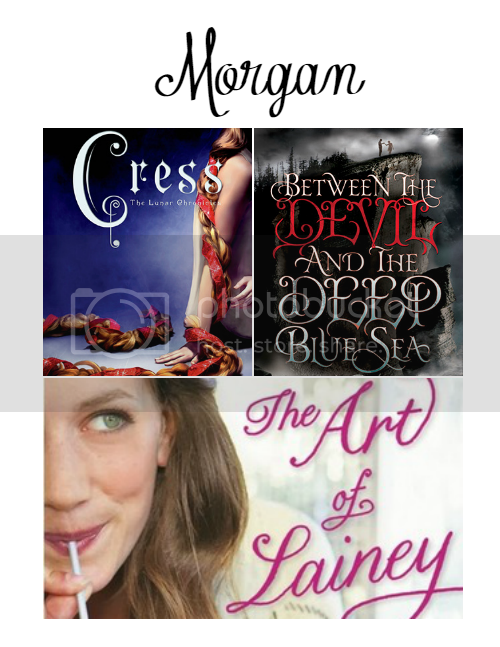 THE ART OF LAINEY <333333 And Winner's Curse. Love it! I loved Ignite Me and NEVER saw that ending, it wasn’t my choice, but I was totally okay with it! And Attachments is my favorite Rainbow book! And One Plus One is on my reread books for 2015 because I felt the same ways you did, Jess! It was the last book I read in my old house, so it has an extra cheesy little place in my heart because of that. AWWWW. Haha! I’m so glad someone loved Cress as much as I do!! Captain Thorne is one of my favorite book boyfriends EVER. I loved Cress! I read it later in the year but actually read all of the Lunar Chronicles in 2014. I can’t wait to read Winner’s Crime either! I love your choices so much! Haha, Winner’s Curse really was torture at the end there, how could she do that to us???? Yey Cress, so pumped for WINTER!!! Fantastic list! I couldn’t agree more with you regarding If I Stay (LOVE that book!) 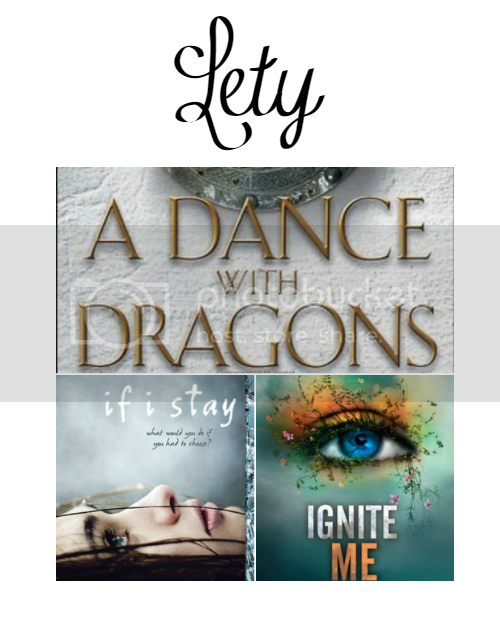 and Ignite Me…such a great series! I also have One Plus One and Looking For Alabrandi on my shelf…must make time to read it in 2015. So many great books! I loved One Plus One, and I’ve finally started the Lunar books (almost done with Cinder). I’m really happy to see Looking for Alibrandi on your list — I just picked up a copy! Wishing you lots of great reading in 2015! I’m SO happy you loved OPO!! I really hope you love Alibrandi too!! 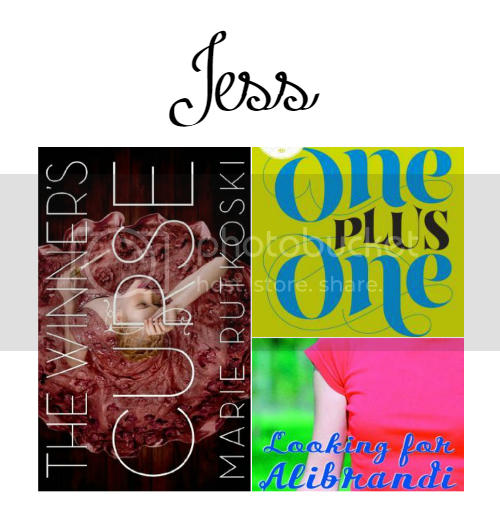 The WInner’s Curse is my top book for 2014. I just finished The WInner’s Crime and I guess technically it’s a 2105 release but it would be my number 2 since I read it this year..
Cress <3 I love that series so much. I need Winter in my life! November is way too far away. The Winner's Curse was fantastic, though I'm terrified to read the sequel. I loved If I Stay, too, though Where She Went it my favorite of the two. Looking for Alibrandi is the only MM book I haven't read – need to get on that!